If you miss the old Zap Mama a cappella sound -- you know, before Marie Daulne went all pop R&B -- then this Czech group will be right up your alley. 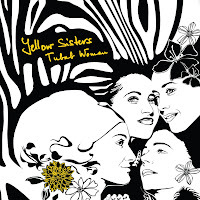 The four singers in Yellow Sisters -- Antonia Nyass, Bára Vaculíková, Léňa, and Lucie Hawa Goldin -- apparently are not biological sisters, though their connection in sound is just as tight as any of the incarnations of Zap Mama. The album starts out with the title track, explaining the African flavor of many of the songs: "I am a woman woman woman / with white skin but black soul." Yes, most of the songs are in English, though it's a Czech group singing African-influenced songs. The few songs in Czech (at least I think it's Czech!) include the experimental animal-noise ambient piece "Ptaci" and the distinctly not a cappella reggae song "Pramen." Maybe it's all the global pop pervading the upcoming World Cup, but I've been hungering for something simple and soulful, and the earthy sound of Yellow Sisters hits the spot.